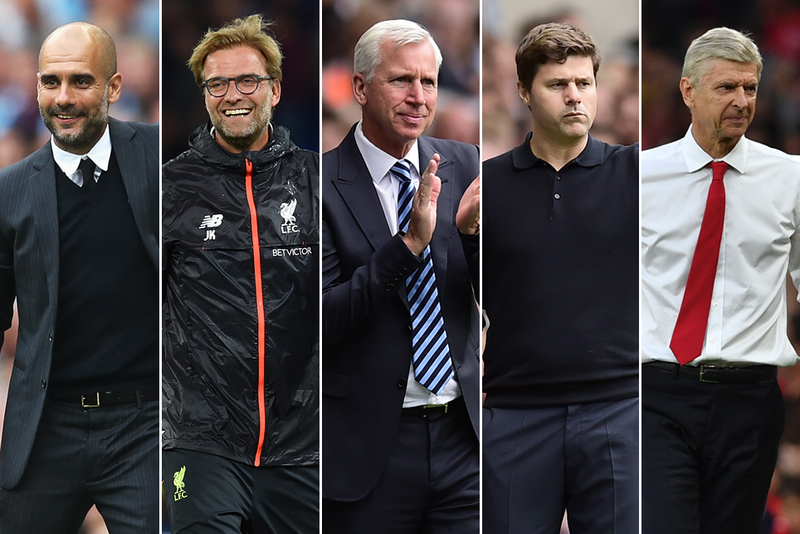 Alan Pardew, the Crystal Palace manager, is among the nominees for the Barclays manager of the month for September. After guiding his side to three victories last month Pardew joins the managers of the top four clubs in the Premier League table, Pep Guardiola of Manchester City, Mauricio Pochettino of Tottenham Hotspur, Liverpool’s Jurgen Klopp and Arsene Wenger, who celebrated his 20th anniversary as manager of Arsenal at the weekend and all won their three matches during the month. The EA SPORTS Manager of the Month award is voted for by a combination of a panel of Premier League legends and, from this season, the public via premierleague.com. The public vote will count for 10% of the total. You can vote below. The vote will close at 23.59 BST on Monday 10 October. Man City continued to lead the way in the top flight as summer arrival Guardiola masterminded three straight wins to stretch his side’s winning sequence to six matches, equalling the record set by Carlo Ancelotti’s Chelsea in 2009/10. The Citizens' attacking football produced seven goals, two of which came in the Manchester derby win at Old Trafford. Klopp's side maintained their convincing start to the season in September with a free-scoring approach that produced three victories, two of which gleaned four goals or more. Indeed the free-scoring Merseysiders were the Premier League's top scorers with 11 goals. Without a win in August, Alan Pardew managed to reverse his side’s sluggish start to the campaign with four unbeaten matches in September, including a 4-0 triumph over Stoke and a thrilling, come-from-behind triumph at Sunderland. Under Pochettino, Tottenham Hotspur stretched their unbeaten start to the season to six Premier League matches with three wins in a row, the most impressive of which was a four-goal triumph at Stoke City. Arsenal recovered from their stuttering start in August to register three successive wins in the following month, culminating in a 3-0 victory against Chelsea, the Gunners’ first Premier League success over the Blues in 10 attempts.